Leslie Latimer was the son of Martha Latimer, of Timaru; husband of C Latimer, of Matilda St; Timaru, New Zealand. "He attended the Timaru Technical School. He was a very good football player and was a prominent member of the Zingari Football Club. He represented the South Canterbury Union in sosme of the matches of the 1913 season and was chosen as half-back for the 1914 team but owingto the outbreak of war and his departure for the Addindgton Camp did not take part in the earlier matches but went down on social leave to assist South Canterbury defeat Otago. He was employed by the Timaru Post Office and was a very popular member of the Timaru postal staff. 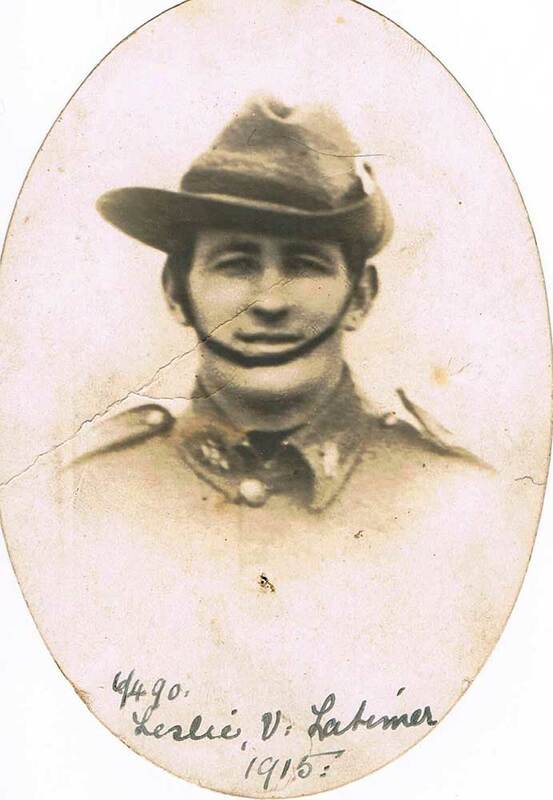 He was one of the earliest enlistments from South Canterbury. Her went through the Gallipoli Campaign and served in France and England. He returned home on leave in March 1918 where he married his sweetheart Catherine (Kitty) Dunn of Temuka on 20 March 1918 at St Mary's Church Timaru. In September 1918 his mother Martha Latimer applied to the Military Appeal Board for her son to be give 6 months leave without pay. He was granted only one month. Who knows but if he had been given that extension of six months he may not have passed away in Trentham Camp from influenza on 14 November 1918."